If you're anything like me, you have a lot of pieces for unfinished projects laying around. I have all the best intentions when I order something or make an 'amazing' find in a store. You know what I mean - you get a brilliant flash of inspiration that compels you to 'Add to Cart' the very thing you need to make that project in your head a reality. Yeah, if you're crafty at all I know it's happened to you at least once. Your perfect idea, your recently purchased 'finishing touch', your blank canvas just sits there staring at you because you either don't have the time or don't make the time to even get started on that brilliant idea that caused you to separate your money from your wallet. So recently, I discovered a small item - just a drop in the bucket really - and determined to just do something with it. It's this Chocolate Songbird Decor Element that oh, by the way, retired in the last catalog. I had a few tiles left over from this project HERE and decided that I could simply rub the decor element piece on to one of them. I added about a yard of the Marina Mist Striped Grosgrain ribbon in a big floppy bow and called it done. 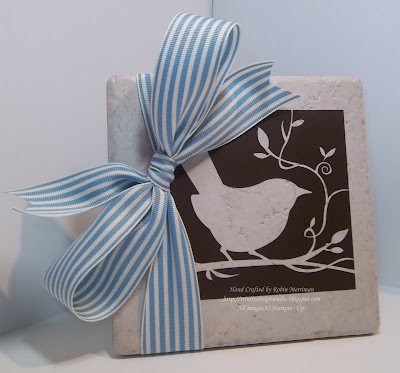 Now, won't this cute little 6" x 6" tile look lovely sitting on my mantel this spring? Yep, I think so too. You know, there's a bunch of smaller sized Decor Elements in our catalog this year. A lot of them will fit on a 6" x 6" tile or even a bit larger size. I encourage you to check them out. You can create a similar quick and easy project for your mantel or bookshelf or even as a gift, in just a few minutes. Don't buy it and then stick it on a shelf or in a cabinet or closet. And hey, if you're looking for a solution to the TIME excuse, map out 4 hours on your calendar this Saturday (2/18 from 10 am - 2 pm) and head on over to my studio for some Open Studio Stamp Time. You bring your unfinished projects, ideas and your consumable supplies and you can have full access to my tools, stamps, inks and what's left of my pea brain to pick. I'll have some snacks, drinks and chocolate to keep you going and it's all for just $5. Or Free with a $30 order. RSVP to let me know you're coming and I'll make sure you have table space especially for you!